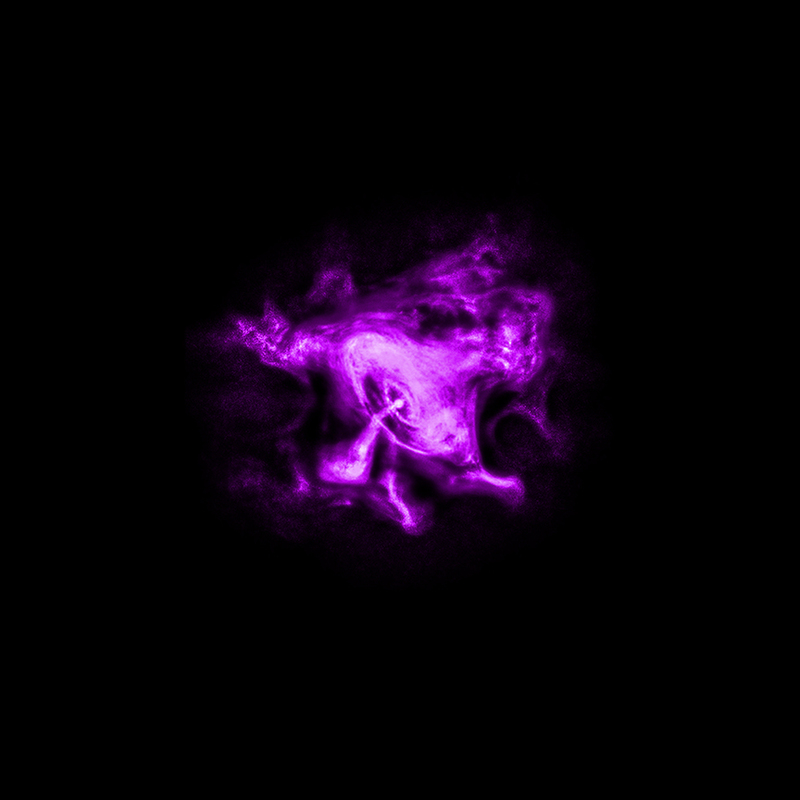 A new multi-wavelength image of the Crab Nebula with data from radio waves to X-rays has been released. This image contains data from Chandra (purple), VLA (red), Spitzer (yellow), Hubble (green), and XMM-Newton (blue). The Crab supernova was observed in 1054 AD and its remnant has become one of the most famous objects in the sky. 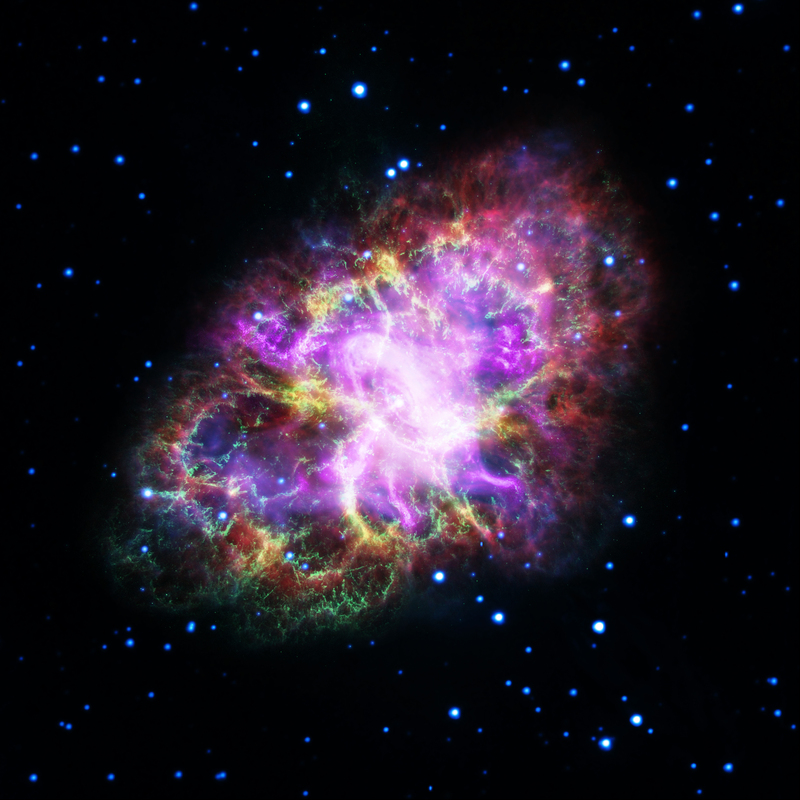 X-rays from Chandra reveal the structure and behavior of the high-energy particles being spewed from the Crab's central pulsar. The Crab Nebula, the result of a bright supernova explosion seen by Chinese and other astronomers in the year 1054, is 6,500 light-years from Earth. At its center is a super-dense neutron star, rotating once every 33 milliseconds, shooting out rotating lighthouse-like beams from radio waves to gamma-ray wavelengths — a pulsar. The nebula's intricate shape is caused by a complex interplay of the pulsar, a fast-moving wind of particles coming from the pulsar, and material originally ejected by the supernova explosion and by the star itself before the explosion. The new VLA, Hubble, and Chandra observations were largely made at about the same time in November 2012. Chandra has been observing the Crab Nebula since shortly after the telescope was launched into space in 1999 and has repeatedly done so in the years since. X-ray data reveal the distribution and behavior of the high-energy particles being spewed from the pulsar at the center of the Crab, which provides important clues to the workings of this mighty cosmic generator producing energy at the rate of 1,000 suns. A paper describing the latest multi-wavelength work on the Crab, led by Gloria Dubner (IAFE), appears in The Astrophysical Journal and is available online. NASA's Marshall Space Flight Center in Huntsville, Alabama, manages the Chandra program for NASA's Science Mission Directorate in Washington. The Smithsonian Astrophysical Observatory in Cambridge, Massachusetts, controls Chandra's science and flight operations. Love the pics. Keep up the good work NASA. Beautiful. Hard to believe though that such a symmetrical, well-defined structure is the result of an explosion. Explosions lead to less order, not more. The result of a bright supernova explosion seen in the year 1054. X-rays from the Chandra X-ray Observatory, combined with optical, infrared, radio, and ultraviolet data from other sources. About 10 light years across. X-rays are purple, ultraviolet is blue, optical is green, infrared is yellow-green, and radio is red.